The music of Glenn Miller is surely the most instantly recognisable sound in modern music. Despite the fact that Glenn Miller died in 1944, his music has continued to remain popular these past 60 years! There have been a plethora of modern day bands attempting to recreate the unique sound of the original Glenn Miller Orchestra yet - only very few of them have come close to achieving that actual sound. The world famous Glenn Miller Tribute Orchestra have succeeded where most others have failed. In using young professional musicians, dressed in authentic full GI uniform, and a first rate and highly knowledgeable front man, they have produced a show which is truly spectacular - and is quite different from the run of the mill concerts on offer these days. Please take the time to read the following review which appeared in 'Big Band Buddies' magazine and website. You cannot fail to be impressed! 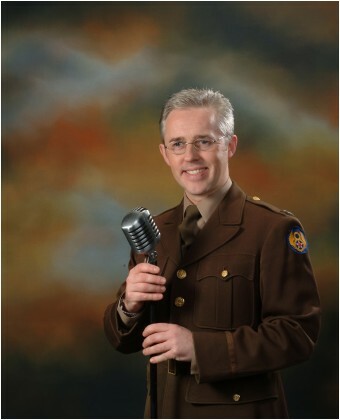 The Musical Director was Paul Barry, a handsome and pleasant mannered man who wrote and presented the program using some well known extracts from the Glenn Miller Story, and the rest from his own knowledge of Glenn Miller history. Throughout the program, he gave us information about Glenn's life and career, as well as history about the tunes the band played, and the members who played those tunes in the original Glenn Miller bands. As the curtain raised, what we saw was a professional looking band who were dedicated to perform their best, and we were quite frankly thrilled and a little spooked as the hairs on the back of our necks raised to this quite emotional start to the concert. The band sounded really good and very close to the original Glenn Miller band. I have never been so satisfied with a concert before because this, from a Glenn Miller fan point of view, was a Glenn Miller Story presentation.